Sōichirō Honda (本田 宗一郎, Honda Sōichirō, November 17, 1906 – August 5, 1991) was a Japanese engineer and industrialist, and founder of Honda Motor Co., Ltd.. Soichiro was born in Hamamatsu, Shizuoka, Japan. Honda spent his early childhood helping his father, Gihei, a blacksmith, with his bicycle repair business. At the time his mother, Mika, was a weaver. At 15, without any formal education, Honda left home and headed to Tokyo to look for work. He obtained an apprenticeship at a garage in 1922, and after some hesitation over his employment, he stayed for six years, working as a car mechanic before returning home to start his own auto repair business in 1928 at the age of 22. In 1937 Honda began producing piston rings for small engines which led to manufacturing small engines to be used in motorcycles, and then in 1948 he started producing complete motorcycles as president of the Honda Motor Company. Honda turned the company into a billion-dollar multinational that produced the best-selling motorcycles in the world. Honda's excellent engineering and clever marketing resulted in Honda motorcycles out-sellingTriumph and Harley-Davidson in their respective home markets. 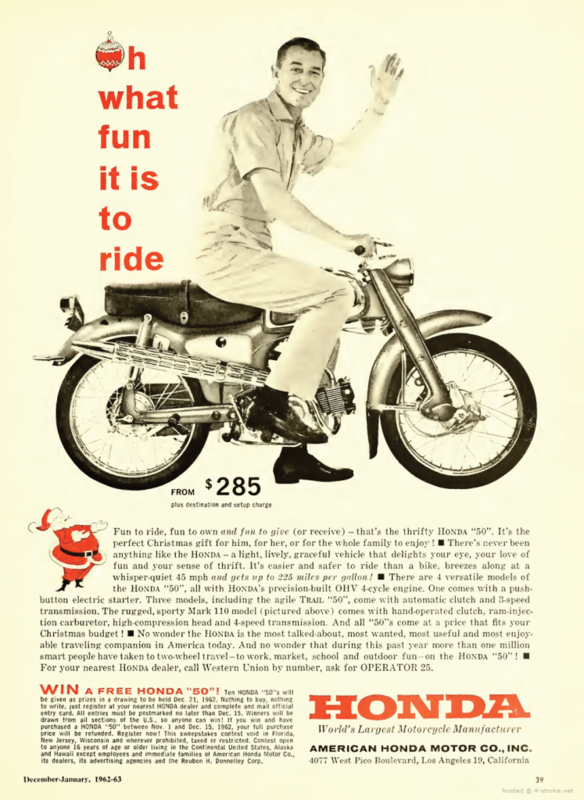 In 1959 Honda Motorcycles opened its first dealership in the United States. Honda remained president until his retirement in 1973, stayed on as director, and was appointed "supreme adviser" in 1983. His legendary status was such that People magazine placed him on their "25 Most Intriguing People of the Year" list for 1980, dubbing him "the Japanese Henry Ford." In retirement Honda busied himself with work connected with the Honda Foundation. He died in 1991 from liver failure. Soichiro Honda was born in Tenryu on November 17, 1906. His father, Gihei Honda, was the local blacksmith, but could turn his hands to most things, including dentistry when the need arose. His mother, Mika, was a weaver. Honda's subsequent spirit of adventure and determination to explore the development of new technology had its roots in his childhood. The family was not wealthy, but Gihei Honda instilled into his children the ethic of hard work, and a love of mechanical things. Soichiro soon learned how to whet the blades of farm machinery, and how to make his own toys. A nearby rice mill was powered by a small engine, and the noise fascinated him. He would demand daily that his grandfather take him to watch it in action. At school he got the nickname "black nose weasel", which is less derogatory in Japanese than it sounds in English, because his face was always dirty from helping his father in the forge. Soichiro Honda's childhood days are full of examples of technical ingenuity, including using a bicycle pedal rubber to replicate his family's seal. At that time, the school handed grade reports to the children, but required that it will be returned stamped with the family seal, to make sure that a parent had seen it. The fraud was soon discovered when Honda started to make forged stamps for other children. Honda did not realise that the stamp had to be mirror-imaged. His family name 本田 was symmetrical when written vertically, so it did not cause problem, but some of other children's family names were not. The bicycles had another use: Those that his father sold from the shop he subsequently opened helped Honda to hone his engineering skills. As he grew, the dream of the car on the country road acted like a magnetic force, drawing him ever closer towards things mechanical. In 1917 a pilot named Art Smith flew into the Wachiyama military airfield to demonstrate his biplane's aerobatic capabilities. Honda raided the family's petty cash box, "borrowed" one of his father's bicycles and rode 20 kilometres to a place he had never before visited. When he got there he soon realized that the price of admission, let alone a flight, was far beyond his meagre means, but after climbing a tree he watched the plane in motion, and that was enough. When Gihei Honda learned what his son had done to get to the airfield, he was more impressed with his initiative, determination and resilience than he was angry with him for taking the money and the bike. When Shinichi Sakibahara raced the car for the first time at Tsurumi, and won the Chairman's Trophy, the young man riding alongside as his mechanic was Soichiro Honda. He was 17 years old. As customers brought in Mercedes, Lincolns and Daimlers for attention, Honda's experience grew in proportion with his ambition. Four years after that first race he started his own Art Shokai auto shop in Hamamatsu. Employees in the Art Shokai shop soon came to understand that sloppy workmanship and poor performance would not be tolerated, but while Honda's tool-hurling antics did not always encourage loyalty, those who stayed recognized his total determination to succeed and to establish an engineering business second to none. Also, Honda was sufficiently aware of his own managerial shortcomings. Honda Motor Co. Ltd. was established in October 1946, initially to build small capacity motorcycles to get Japanese workers mobile. Honda focused his considerable energies on the engineering side, using all the experience he had painstakingly accumulated, including time taken to study piston ring design at Hamamatsu Tech and subsequent experimentation with a small engine-powered bicycle. He left the running of the company in the hands of Takeo Fujisawa, his most trusted friend, and urged him to look to the long-term. They complemented one another perfectly. The first fruit of their partnership that hit the streets was that of a 98 cc two-stroke motorcycle appropriately named "Dream". Several times Honda Motor Co. sailed close to the rocks in the years that followed, for both Honda and Fujisawa were gamblers who knew that expansion would only be possible with risk. Growth at one stage was unprecedented, until the purchase of state-of-the-art machinery in the early 1950s led them perilously close to bankruptcy. Honda stated that "Without Fujisawa, we would have gone bust a long time ago" while Fujisawa stated that "Without Honda, we would have never become this big". Honda claimed that he had never touched nor seen the company seal (hanko). Later, when the Juno scooter flopped and bankruptcy again beckoned, his reaction was to embark on the Tourist Trophy race program that would eventually make Honda's name as an international motorcycle manufacturer. It took him five years, but by 1959 Hondas were racing on the Isle of Man. Two years later they won the TT. In 1963, a 1.5 litre V12, designed by Honda engineer (and future president) Tadashi Kume, was produced for Formula One. Honda Racing's first F1 win as entrant, constructor, and engine supplier was in 1965 (the last race for the 1.5 non-supercharged formula; the first F1 win for Goodyear tires). In 1966, Honda entered Formula Two (1.0 litre) racing and Jack Brabham won 11 straight races, becoming the F2 champion. Meanwhile, F1's displacement limit grew to 3.0 litres; Honda produced a 400-hp V-12 engine for the revised class. Still in 1966, Honda won the Constructor's Championships in all five motorcycle Grand Prix classes. In 1967, John Surtees won the Italian Grand Prix Formula One race, Honda's first 3.0 litre F1 victory. Honda had great successes in the mid to late 1980s and beginning of the 1990s supplying Williams and McLaren F1 teams and Honda Racing continued to participate in F1 as entrant, constructor, and engine supplier through 2008 with some interruptions. Even at his advanced age, Soichiro and his wife Sachi both held private pilot's licences. He also enjoyed skiing, hang-gliding and ballooning at 77, and he was a highly accomplished artist. He and Fujisawa made a pact never to force their own sons to join the company. His son, Hirotoshi Honda, was the founder and former CEO of Mugen Motorsports, a tuner for Honda vehicles who also created original racing vehicles. A plea to save history! More historical articles have arrived!